I freely admit that I am tired…..very tired of those last 25 lbs of post baby weight. Just before Christmas I committed to starting a fitness program and have been eating whole foods and making healthier choices. My clothes had started to feel looser and I realized that I didn’t have a reliable bathroom scale to see if I had actually lost any pounds in my weight loss efforts. 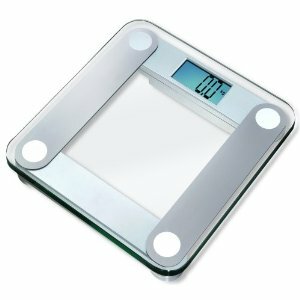 EatSmart has expanded their line of bathroom scales and I had the opportunity to try their Precision Digital Bathroom Scale™. What attracted me to this particular scale is the “Step On” technology which means you simply “step on it and get an instant reading.” The scale has four high precision measures which makes this scale very accurate in my experience. All three of my children were weighed at their annual physician’s check up and all of the weights match to the pound on the EatSmart Precision Digital Bathroom Scale™ when we got home. I also appreciated that the scale is auto calibrated so there was nothing confusing that I needed to do to set it up (in the past I had a terrible time with another brand scale that needed to be calibrated). The EatSmart Precision Digital Bathroom Scale™ is stylishly made with tempered glass and it is sleek so it doesn’t take up a lot of space in my bathroom. It felt very sturdy and can hold up to 400 lbs. I also like the “large 3.5” LCD display” because it is very easy to see and has a nice blue backlight. If you have been frustrated in the past by a scale that gives you different readings each time you step on it simultaneously then I think you will be very pleased with the EatSmart Precision Digital Bathroom Scale™. I put my poor scale through numerous “tests” and sure enough it registered the same until I drank a large glass of water and it registered the additional 16 ounces. I was very impressed with the price too as I found it on sale on Amazon for only $28.95 which is a great deal for this quality precision scale. I like the food scale.